Hey guys! Did you have a good weekend? I didn’t leave the Owen homestead Saturday or Sunday. 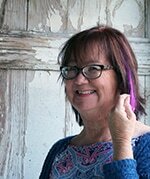 I spent a lot of time in the workshop either working on projects or straightening up a little (hahahaha). I started painting a piece of furniture and the whole process went down hill. My plan didn’t come together so it’s still a work in progress. 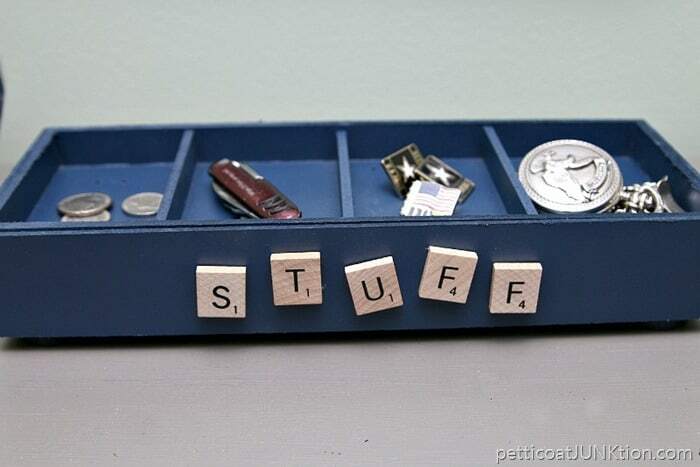 I did get this little organizer for hubby finished up. I paid $1.99 for the divided box with numbers. The numbers were “2007”. I used the 2 in a project this weekend (to be shared in a couple of weeks). 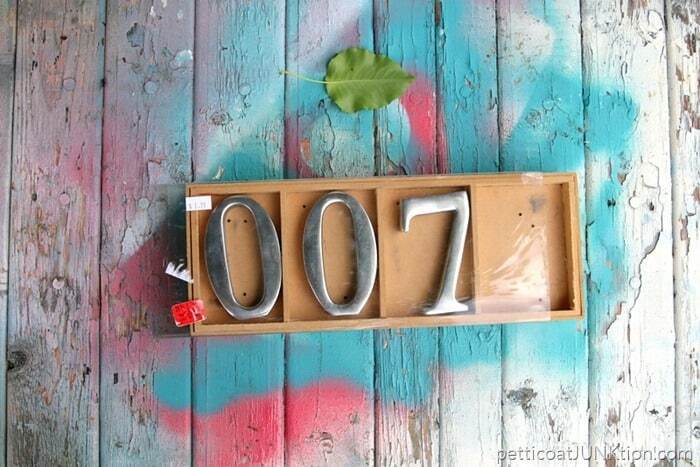 Now I still have the “007” which is kind of cool……and I still have the box. The divided tray lifts up and there is storage underneath. How cool is that. I try to never throw anything away so what to do with the box?? 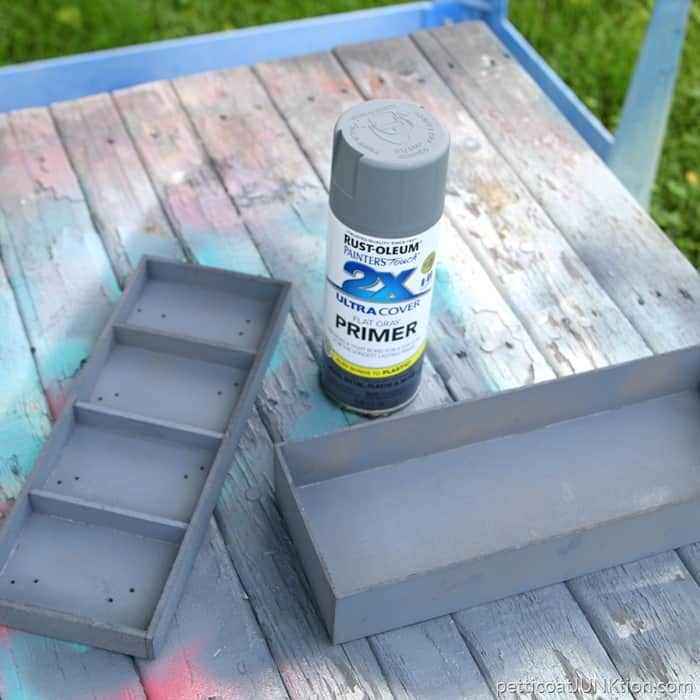 I first applied a coat of Rust-Oleum spray paint primer. My favorite. I went through my stash of spray paint looking for a guy color. This blue is perfect. I also spray painted 4 checkers to give the box little feet. What do you guys think of all this new hardware? I almost forgot I had it. I bought it at an auction about 7 or 8 years ago when we lived in Florida. 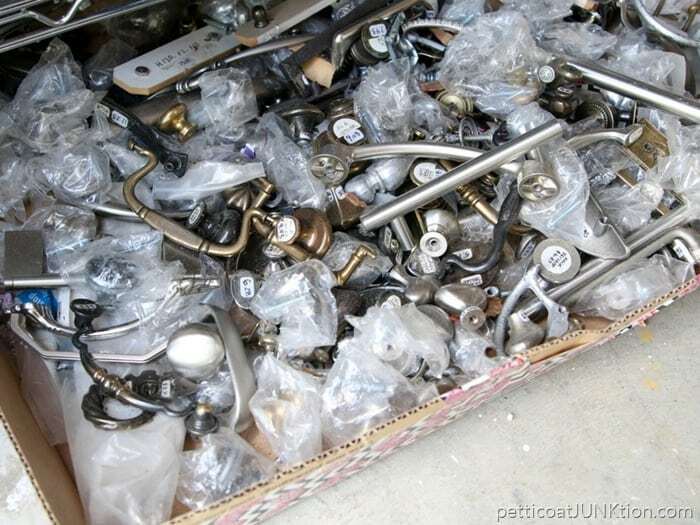 I got a big lot of it….a couple hundred pieces at least. I think I paid $50 or so. The hardware is all new and some of it is marked as high as $15/piece. I did use a lot of the pieces but then put the box away and forgot all about it. The reason I pulled out the hardware was because I was thinking of adding a pull to the divided tray so it could be lifted up easily. I decided not to do that but glad I remembered about the hardware. I applied the checker “feet” with hot glue. 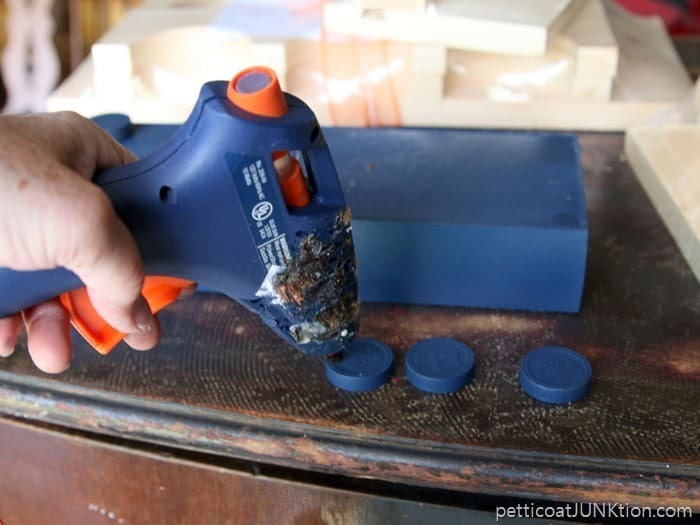 I know….my glue gun is a mess…….don’t judge me. The box needed something so I pulled out a bag of Scrabble tiles. I also applied the tiles with hot glue. 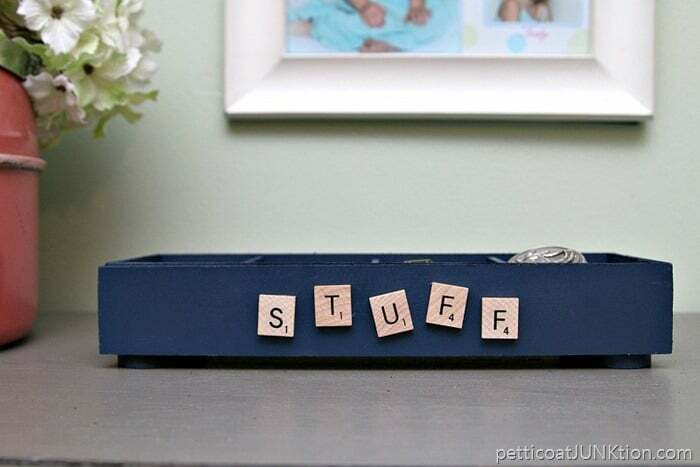 Instead of “stuff” I almost put “The JTS” on the box. For you newbies here The JTS refers to my hubby also known as The Junktion Technical Specialist. 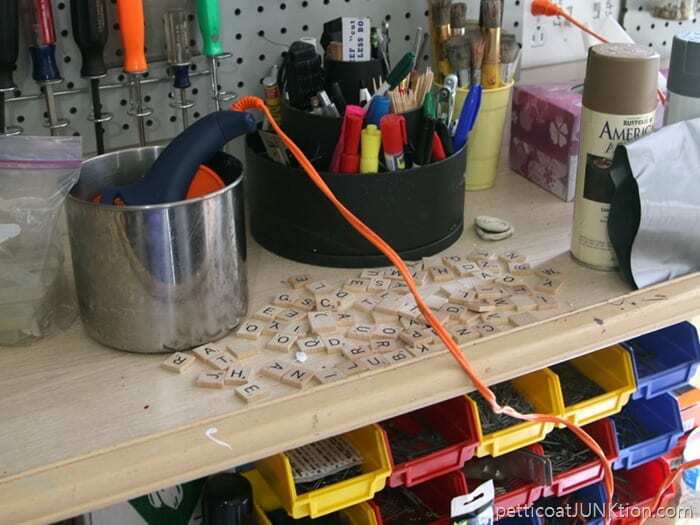 The area under the tray is great for storing photos and special stuff. 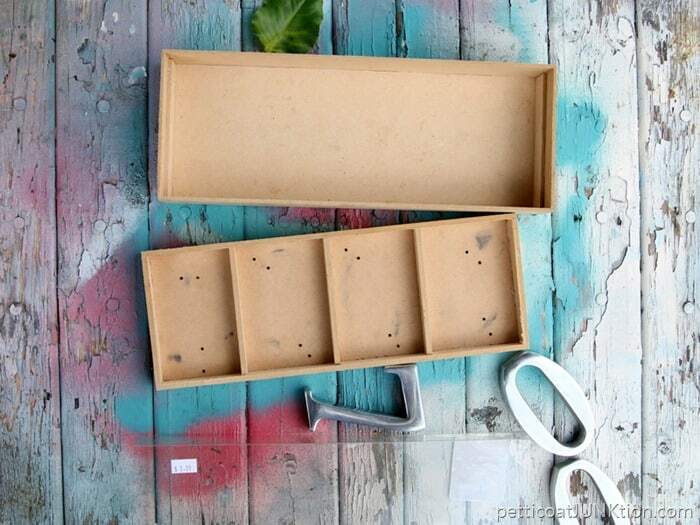 Well, that’s the story of the box turned DIY organizer. I wonder how many projects I can get out of that one $1.99 purchase? 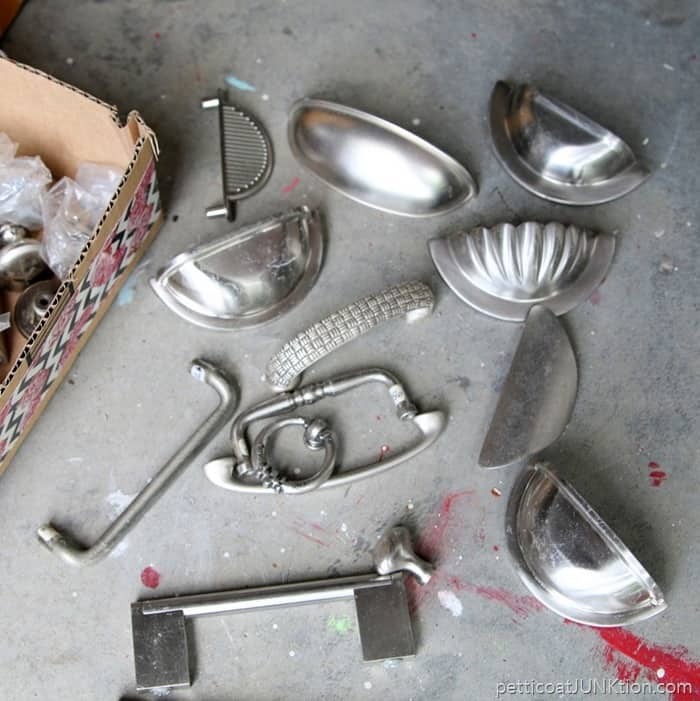 Did you guys do any junk shopping or DIYing over the weekend? Thanks for all the replies to my “unsubscribe” newsletter last week. It looks like the majority (by a large margin) prefer to get emails every time I have a new post. I will research ways to deliver a once a week email to you guys that prefer that method. Thanks for being here and have a great day! I’m off to work on that problem paint project. Thank you so much for sharing this! 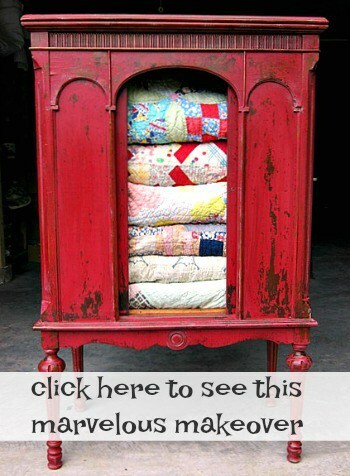 I absolutely love projects that are completely upcycled. I have a tendency to never throw anything away so this inspires me to do something with a cigar box I have in the back of my closet! You are so blessed to have a brain that thinks of these great ideas. I NEVER thought of checkers! Love! Great project! I love using scrabble tiles and the checkers…brilliant. What a SCORE! on the hardware box of treasures.. Cute, cute, cute! 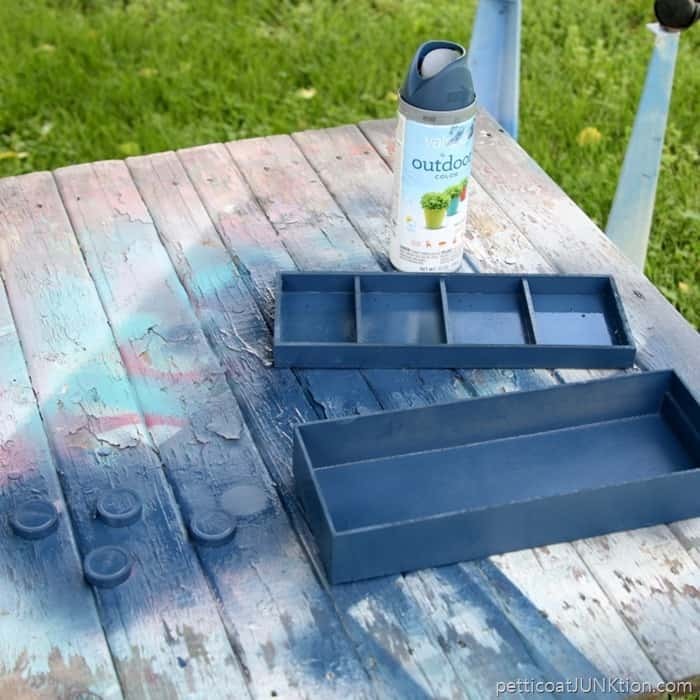 Love what you can do with an old dirty box that some people would just toss out. 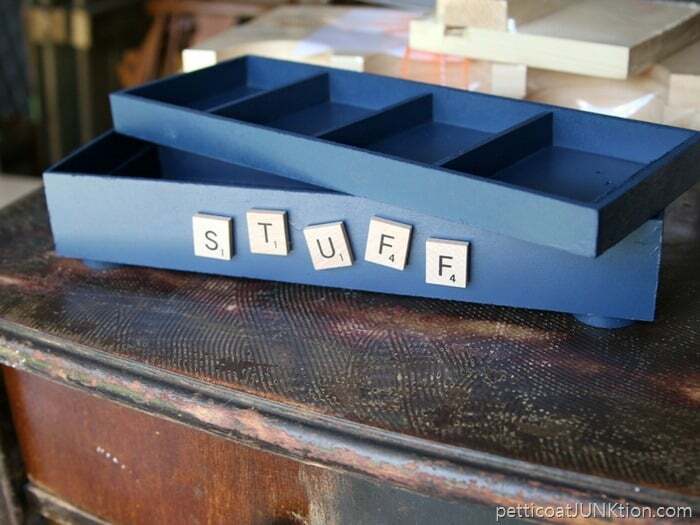 I upcycle and repurpose, too, so appreciate anyone’s reusing and “prettyfying” and just think – “A man would appreciate this!” Love scrabble piece words and also the checker feet – wouldn’t have thought of that! 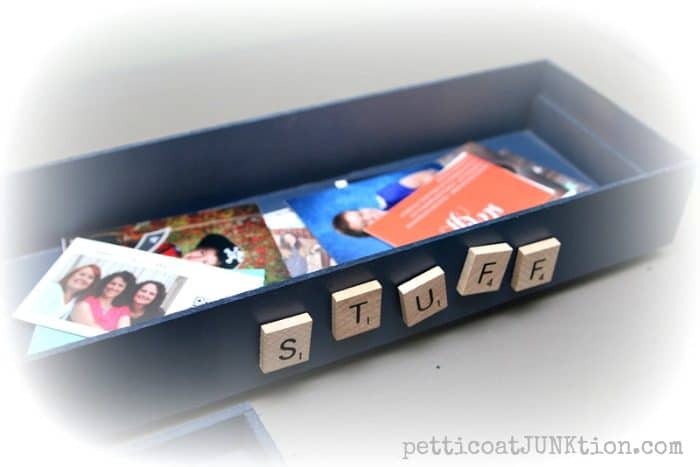 Love the “stuff” box for the JTS! Great color and I love the added bonus of the tray lifting out for more space under it. 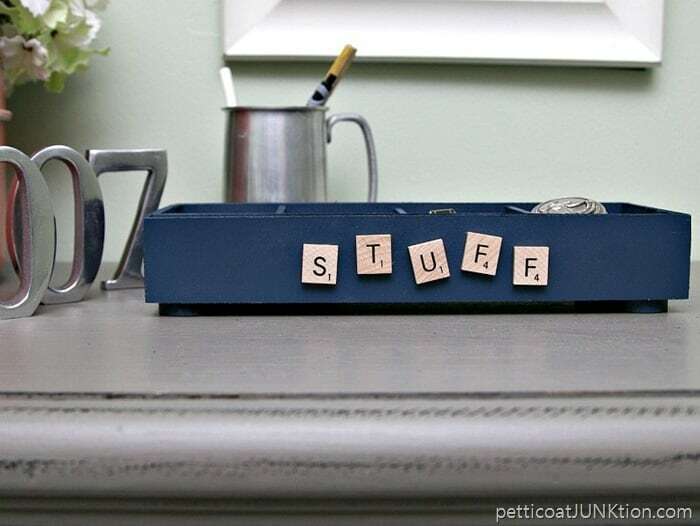 Great Idea for a place for “him” to empty his pockets (instead of on the table or counter)!